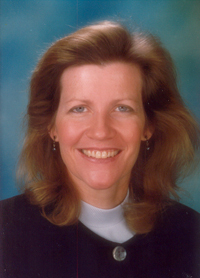 Dr. Theresa Burke is the Founder of Rachel’s Vineyard – the largest post abortion ministry in the world. Her healing programs offer a unique sensory based treatment which integrates emotional, psychological and spiritual dimensions. The healing journey uses creative “Living Scripture Exercises,” and rituals which engage the mind, body, and soul. The Living Scriptures coupled with group activities, prayer, therapeutic facilitation, cognitive restructuring and discussions offer an effective process for grief work grounded in Jesus Christ and the Word of God. This distinct program provides an exceptional and effective recovery process for victims of trauma and those who have spent years in talk therapy, but still struggle to move beyond their traumatic experience. Since 1993, the Rachel’s Vineyard model has spread to 49 states and over 70 countries. The Rachel’s Vineyard retreat is currently offered in 22 languages, with other translations in progress. Rachel’s Vineyard is a ministry of Priests for Life/Gospel of Life Ministries. Theresa has facilitated the Rachel’s Vineyard weekend for women and men throughout the country, training retreat teams in the method and process. She has lectured and trained professionals internationally on the subject of post-abortion trauma and healing.Her books include Forbidden Grief - The Unspoken Pain of Abortion with David C. Reardon (Acorn Books), The Contraception of Grief – The Genesis of Anguish Conceived by Abortifacients and Sterilization and Sharing the Heart of Christ, with Kevin Burke. 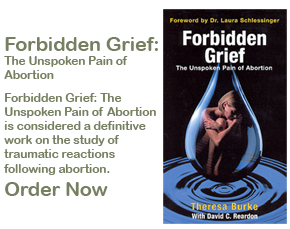 Forbidden Grief is also available in Spanish, Duelo Prohibido: El Dolor No Expresado del Aborto and Russian, Запрещенные слезы. О чем не рассказывают женщины после аборта. Theresa also developed a five day program for healing sexual abuse entitled – Grief to Grace – Reclaiming the Gift of Human Dignity. This program has been used to address all forms of abuse, including sexual abuse from clergy and religious. Professionally crafted and doctrinally sound, Grief to Grace provides professional therapeutic staff and all treatment is based on a firm Christian foundation as well as sound medical and psychological principles and a perceptive understanding of trauma. Her treatment programs are considered an intensive and uninterrupted “therapy for the soul.” Theresa’s latest treatment model addresses the spiritual and psychological trauma suffered by combat veterans. The program is entitled Duty To Heal – Finding Peace for a Soldiers Heart. Future plans are also on way for two additional healing programs: Genesis After Genocide, a program for psychological and spiritual reconciliation and healing due to the trauma of genocide, terrorism, and civil war; and Soul Care to Restore the Foundation of Your Spirit: An Integrated Psychological and Spiritual Sensory Based Treatment for Medical Trauma for those who have suffered with trauma from cancer treatments, surgical procedures, and other traumatic illnesses. Theresa serves as a Pastoral Associate of Priests for Life and for the newly formed Apostolic Society, Missionaries of the Gospel of Life. She recently presented as an expert for the 2011 Pontifical Academy of Life’s General Assembly. Her topic was The Aftermath of Abortion: Data from Scientific Literature. Theresa’s counseling work has focused on women’s issues, bereavement, pregnancy loss, sexual abuse, eating disorders and anxiety management. She is the co-administrator and founder of Covenant Family Resources, a licensed Children and Youth Agency which supports couples as they build families through adoption. Theresa and her husband ran Mother’s Home, a crisis pregnancy residence, which provided housing and computer job training for women in crisis pregnancy and their children. Theresa holds an undergraduate degree in English Communications with a concentration in social work. Theresa went on to Immaculata University to earn an M.A. and Ph.D. in Counseling Psychology. She is a Nationally Certified Psychologist, a Certified Diplomat of the American Psychotherapy Association, a Licensed Professional Counselor, a Board Certified Clinical Psychotherapist, and a Diplomat of the American Board of Forensic Counselors. She holds membership in the Society for Catholic Social Scientists and the American Association of Christian Counselors. Theresa is the proud mother of five children.